Picking a venue is one of the first decisions you should make. There are multiple companies that specialize in weddings in the Great Smoky Mountains National Park, from waterfalls to mountaintops. 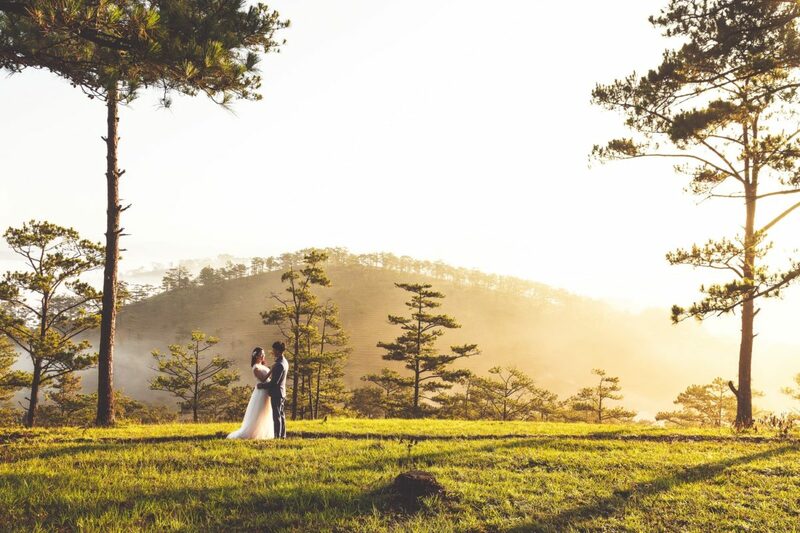 For those feeling less adventurous, there are plenty of other places for an outdoor wedding that do not require hiking boots, but still offer an amazing view. On the other hand, you may not be an outdoorsy type, but love the country charm of the Appalachians. Choose a wedding chapel or church for a more traditional wedding or take advantage of the area and pick a renovated barn or farmstead. Some Smoky Mountain weddings are even at a vineyard! Next, choose a theme. With the beautiful mountainous setting, many weddings in the Smokies have either a natural or country theme. The Smokies are home to many beautiful wildflowers and simple bouquets and centerpieces look great with a mountain backdrop. Wood and burlap with a floral accent, on the other hand, also fits the location. Making the wedding go off without a hitch means hiring a variety of people to help. With the Smokies being such a popular wedding destination, you will have a great selection for the officiant, photographer, videographer, deejay, florist, and planner. The great news is that many companies offer wedding packages that take care of all these arrangements. For the final piece on the day, you will want to choose a catering company. The various venues are used to accommodating groups that range from small to large and each offers different cuisine. Prefer a more casual vibe? How about a barbecue or finger foods? If you prefer a more formal setting, choose an elegant menu. All that remains now is to buy your wedding dress and organize your wedding party! With everyone from the wedding party to family making an appearance, why not reserve several of our cabins in Gatlinburg for everyone involved? Many of our cabins are near each other and, with much more space than a hotel room, there will plenty of privacy as well as room to plan. Afterward, move into one of our romantic honeymoon cabins, which offer hot tubs, jacuzzis, and fireplaces to cuddle with each other. You will be glad you made your wedding HQ with us!